[New for 2014] Bummer, I really wish I had reviewed this ice cream last week because I wouldn't feel as silly declaring it as one of the prettiest new ice creams of 2014. But it's 2015 and I think we're all burnt out on countdowns by now. So, let's just review this one with the disclaimer/apology that I should have tried it sooner but I was way too amused by the limited edition ice cream cake flavor to bother picking this one up sooner. I popped the lid and take a whiff of one very sweet smelling ice cream. (Wait, disclaimer #2, I always buy these flavors for my daughter, not myself, so get ready for the critiques). I take my first bite and it tastes as potent as it smells! 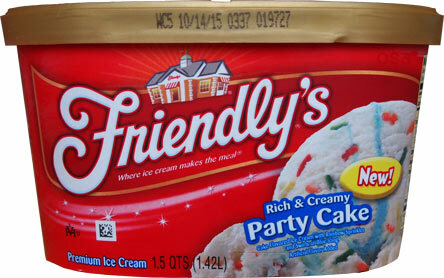 Holy freholy is that a great looking ice cream! The abundant bright blue swirls against the white backdrop are awesome to me. What? I eat with my eyes, I can't help it! I take some more bites and it is indeed a doozy of a flavor. There's a potent... somethin' somethin' to the base. It's like cold liquid something...it's not straight batter, maybe like batter flavored milk? It's strong and not for the faint of heart. The swirls are surprising here. They kind of remind me of those soft (waxy) sugar chips we find in flavors from time to time. It's a sugar rush, but just look how thick it can get, that's crazy! Enough ranting, let's find out what my daughter thinks: She likes it! She likes it so much that she kind of finished it on me before I got an official second scooping in. 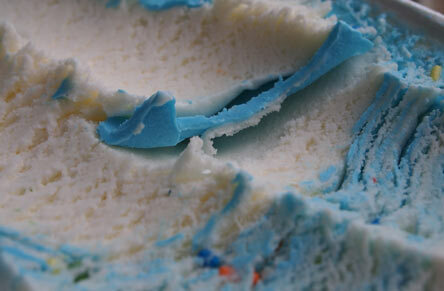 Hehehehe, oh she does love her cake flavored ice creams, especially when they look as awesome as this. ALLERGEN ALERT(?) 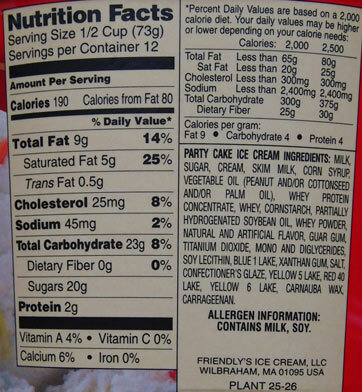 Apparently Friendly's leaves the door open for using peanut oil in place of vegetable oil and then forgetting to put that tidbit of knowledge in the allergen panel. What is up with that? Yes, I know that processed peanut oil is SUPPOSED to be safe for the "overwhelming majority" of sensitive people, but what happens when you aren't in the majority? 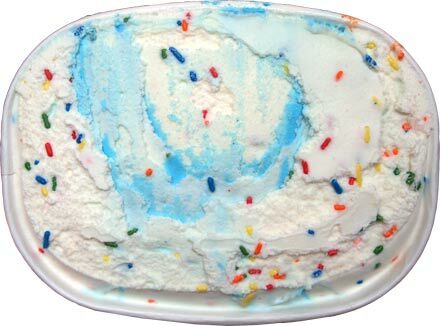 It looks just like Blue Bunny's Birthday Party ice cream. @Stride: the gist is the same, but the swirl is different as are the bits. @Anon: They do it to save a penny and for no other reason. I don't like it and I don't like taking chances. I picked up a carton of this after reading your review. Love it. The blue part actually tastes like fondant.